Used ever more frequently in the world of events, video mapping has become a required feature to make public gatherings stand out and give the audience a truely unique experience. As a genuine multimedia show, mapping is attracting many companies in their quest for innovative and immersive experiences. Let VIDELIO-Events be your guide in the discovery of this exciting field. First of all, what is video mapping ? Video mapping, also known as "3D mapping" is a projection technique which allows to bring to life buildings or physical objects, either static or in movement by projecting animated visual content upon their surface. The video content is sized with millimeter precision to the projection surface in order to cover perfectly its shape. Mapping is frequently done in unusual locations not meant for the purpose and with the goal of creating the illusion of a texture. It is often used for shows after nightfall to fully benefit of all the effects of colours and lights such as in the famous Fête des Lumières, a yearly event in the city of Lyon. But what is the difference between video mapping and video projection ? Mapping is by its very nature a form of video projection but the reverse is not always true. Video projection in itself is a wider field implying the use of a projector and video content but within this context the video content is only used as a background element. In order to create a mapping, the first step consists in a complete analysis of all the dimensions of the object or building upon which the mapping will be done, the goal being to have all the data required to create the proper content. Then the object or building is transformed into a computer model using software tools. Once the model has been created, enters the graphics design stage which usually starts with a storyboard. This allows to structure the ideas and the story the artist wants to tell. Once the video content is achieved, the only task that remains is to bring it to life with video projectors and let the magic begin. 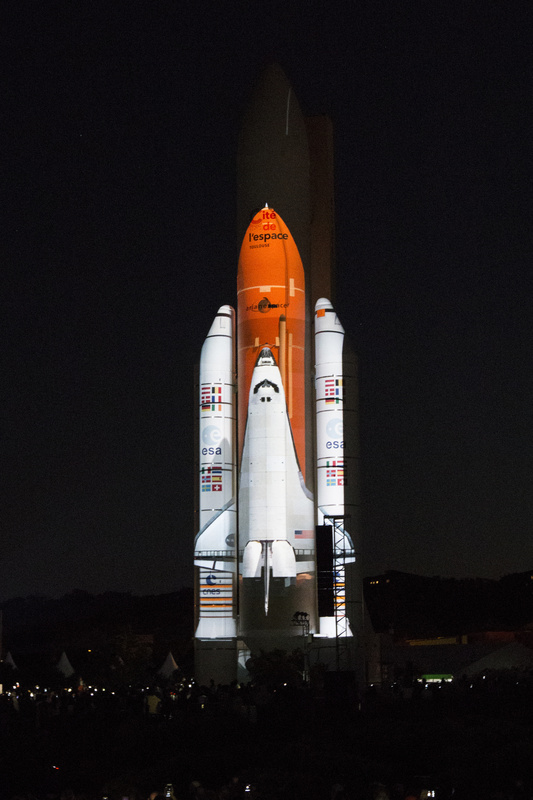 Video mapping is a powerful communication tool with nearly limitless creation possibilities. It allows to enhance a monument or a product for an event, turning them into true "magic moments". Whatever the projection surface, video mapping allows to reshape the visible reality and to animate static structures. It's a genuine and unique sensory experience turned towards the future, thus projecting the viewer into the heart of the work of art. Finally it is also possible to use video mapping during oral presentations in order to dramatise the event and increase audience attention. What are the novelties in terms of mapping ? Today, thanks to always more powerful and precise media systems it has become possible to map moving objects. By using sensors placed upon the object, the mapping content tracks the shape even while moving. To create interactivity, it is also possible through the use of a tablet to select the textures projected upon the object, to guide the movement, control the projection zones… all sorts of new possibilities to enhance a product in an innovative manner. 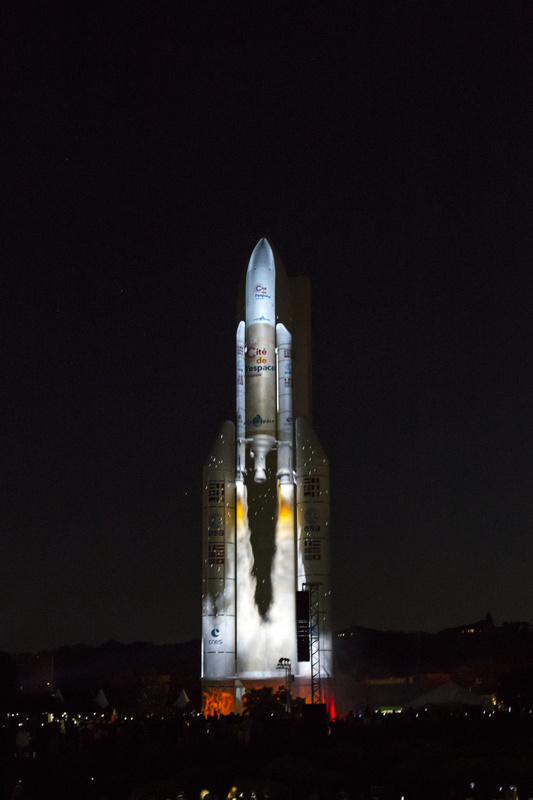 For the 20th anniversary of the Cité de l'Espace in Toulouse, VIDELIO-Events created a breathtaking mapping onto the Ariane 5 rocket. An absolutely gorgeous presentation with video content created by Spectre Lab. On october 15th 2017, no less than 18 thousand viewers enjoyed this unforgettable event. An innovative way to put forward a building and to astonish the audience during an event. To relive the event in video, please click here.
" Peur sur le Parc " at the Astérix amusement park. 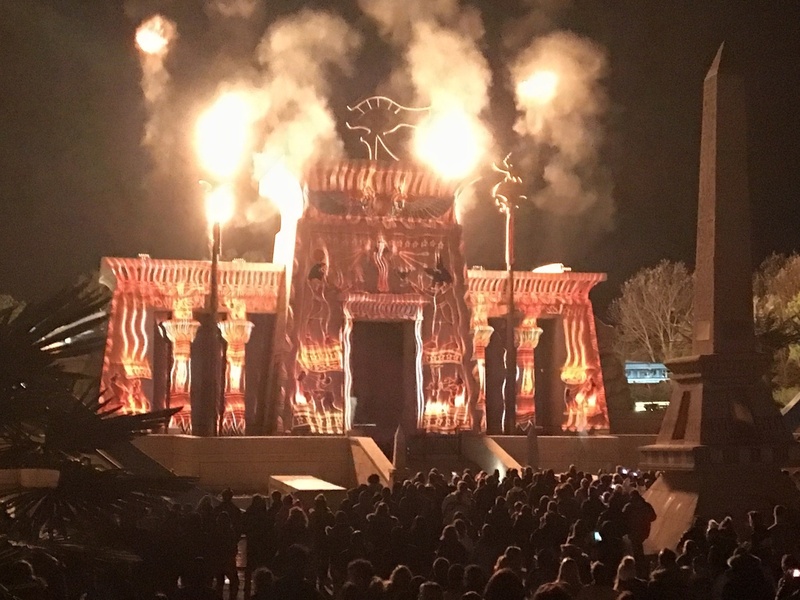 A complete audio, video and lighting show for which we created a mapping shown hourly from 7 PM to 1 AM on the theme of Egypt. For the 2018 New Year wishes of the Mayor of the city of Liévin and the inauguration of the recently restored Town Hall, VIDELIO - Events was in charge of a mapping operation. At 6:30 PM the mayor made his speech and during twelve minutes the Town Hall came alive with animations, colours and video effects. A breathtaking show repeated 4 times during the evening which enthralled all the citizens. During the trade show Heavent Meetings 2017 in Cannes, VIDELIO - Events presented on april 19th and 20th an experiment in interactive mapping at the Palais des Festivals. The experiment named "int'tracking" was produced in partnership with Holymage and featured a mapping tracked onto a moving 3D object. This tracked mapping device allows to control both the projected video content and the movement of the object thanks to the Modulo Kinetic technology. To relive the event in video, please click here. 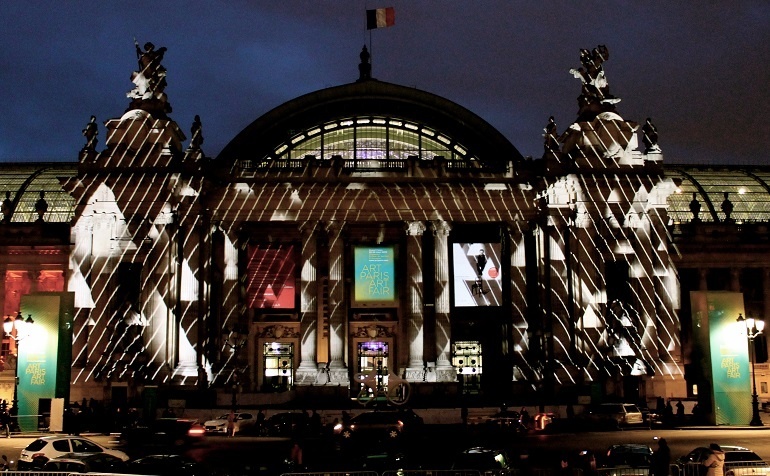 VIDELIO - Events will realize this year a mapping video on " Le Grand Palais " for the Art Paris Art Fair wich will take place from the 5th to the 8th of april 2018.